The tsuitate is a Japanese freestanding low screen. Typically consisting of a single wood or paper panel and often very ornate. Many examples are decorated with paintings. Others have panels that are constructed from a particularly beautiful piece of timber. This screen is a sort of jack of all trades piece of furnishing. Sometimes used as a status piece at the entrance to a home. Other times used to simply block a draft or divide off a space. I find it interesting that so many cultures developed and used freestanding and portable screens throughout history but they are rarely used these days. I wonder what has changed that we no longer feel the need to have them or find them of little use other than for decoration. That’s an entirely different discussion though. I have a very specific need for a screen at present. The male offspring is in high school and, like just about every teenager, carries a backpack. When he comes home from school the backpack gets dumped inside the front door at the entrance to the living room. Along with his shoes and jacket. The shoes and jacket can be dealt with by him stowing them away in the entry closet, but the backpack is a different matter. Add to that the occasional visiter with a handbag and the entrance to the living room begins to look cluttered. Now I don’t typically suffer from OCD, but for some reason this little situation is wearing on the one fragile nerve that I have left. For my sanity and the boy’s health something must be done. So a screen is in order to block this jumble from my view and since I have a penchant for the Japanese aesthetic, I’m going to tackle a version of the Japanese tsuitate. Here is where I’ll add my typical disclaimer. This will be my best guess as to the construction and will have my own take as to the design. Reckless and irreverent as always, but surely you have come to expect that by now. So that brings us to the Hillbilly Tsuitate. A simple frame and panel arrangement mounted on feet, much like a trestle. The local Home Depot has now begun carrying fir 2×4’s in addition to the standard SPF. The fir has the typical pinkish hue that is associated with fir. It is from these fir 2×4’s that I will cull the bulk of the lumber for this project. The feet will be from fir 4×4’s. I’ll turn to the mystery pine that Home Depot sells for the large center panel. I like this pine for its grain and how well it responds to the uzukuri finishing treatment. The top and bottom panel will have their fields filled with evenly spaced bamboo skewers. The fir will give me a pinkish tone to the framing with should contrast nicely with the white tones of the pine and bamboo. I’ll be milling up the pieces over the next few days and start the joinery. 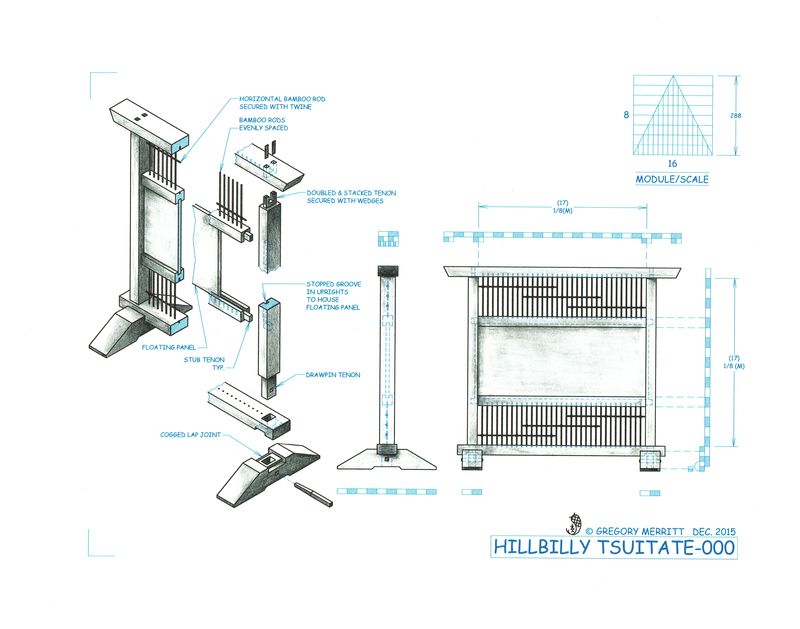 This entry was posted in Hillbilly Tsuitate-000 and tagged freestanding screen, Japanese screen, screen, tsuitate. Bookmark the permalink. I like the drawpin tenon detail, strong as all get-out once done no doubt. Thanks Brian. This will be a joinery only assembly. No glue, so I hope the drawpin pulls it all together tightly and holds it there. Wow. This looks like a really fun project. Mystery pine, lol. I think you will find the joint between foot and crosspiece is the perfect location to use your 45 degree mitered lap joint discussed in your earlier post. Good luck with everything. That was my first thought but I couldn’t get the lap depth to work the way I wanted when adding the mitered corners. plus I wanted to keep as much “meat” as I could for the intersecting mortise and tenon. I do have a sketch or two using the mitered version of the lap joint, but have yet to get the proportions to work out to my liking. So this simpler version will serve for this first iteration.